Inspiration and encouragement for cultivating kindness–by embracing the joy, suffering, confusion, and brilliance of our everyday lives. Do you want to be a more compassionate person, confident and unafraid to love yourself and the world around you unconditionally, but aren’t sure how? We often look far and wide for guidance to become better people, as though the answers were somewhere out there. 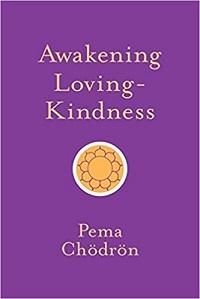 But Pema suggests that the best and most direct teacher for awakening loving-kindness is in fact your very own life. Based on talks given during a one-month meditation retreat at Gampo Abbey, where Pema lives and teaches, her teachings here focus on learning how to see the events of our lives as the perfect material for learning to love ourselves and our world playfully and wholeheartedly—and to live in our skin fearlessly, without aggression, harshness, or shame. This is instruction for embarking on the greatest adventure of all, to come alive to your inherent human kindness.